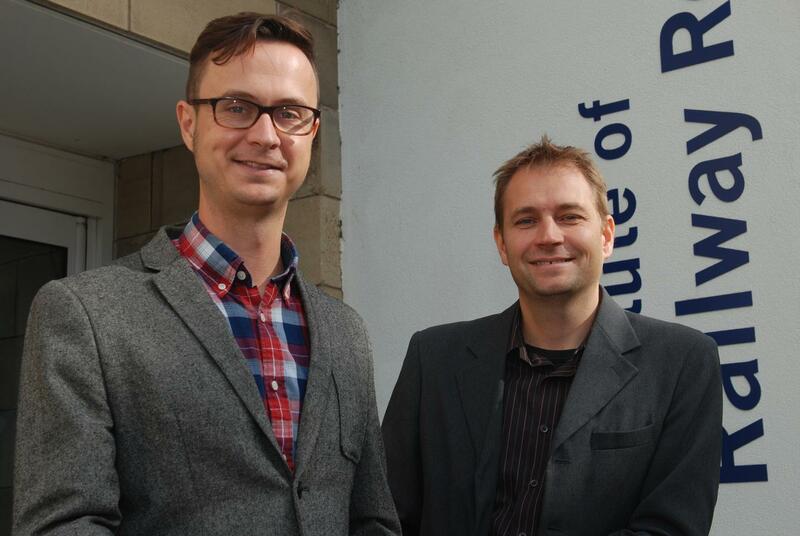 RESEARCH that could lead to big efficiency gains and cost savings for rail vehicle manufacturers has earned University of Huddersfield experts a share in a prestigious award that commemorates one of Britain's most famous engineers. The George Stephenson Gold Medal is bestowed by the Institution of Mechanical Engineers (IMechE) to authors of the best original paper that it has published over the past year. In 2016, the judges selected Track loading limits and cross-acceptance of vehicle approvals. This describes a project that has made a significant impact, helping to rewrite European rail regulations. Among the co-authors are Dr Yann Bezin and Dr Gareth Tucker of the University of Huddersfield's Institute of Railway Research. They received their awards at a special conference of the IMechE – founded in 1847, with rail pioneer George Stephenson as the inaugural president. Dr Bezin and Dr Tucker were members of a nine-strong, multinational team that undertook one of the work packages that were part of a four-year project named DynoTRAIN. This was funded to the tune of €5.3m via the EU's 7th Framework Programme and dealt with issues that included "railway interoperability" – the extent to which vehicles and rolling stock can be used on the tracks of different countries. "The manufacturers are international, so they want to sell their vehicle to anywhere in Europe, but in the past they have had to do an acceptance test in every country and that's expensive and time-consuming," said Dr Tucker. "So if they are only required to test it in one country, they are obviously going to save a lot of money. That trickles down to the people buying the vehicles and hopefully in the end it gets to the passenger." The DynoTRAIN researchers established that computer simulation was a safe and acceptable supplement to the necessity to seek out and use actual tracks that contained relevant characteristics for testing. This can involve considerable amounts of costly and time-consuming resources. "We have shown in the project that a large range of representative track measures taken across member states can be combined together to offer a virtual simulation testing platform statistically more representative than expensive physical on-track test", said Dr Bezin. The research has already made an impact, with the implementation of a new common standard – or European Norm – that allows the use of more simulation as a supplement to physical testing for rail vehicles. The result could be an efficiency gain of 30 percent of train running safety tests for manufacturers, said Dr Tucker, who joined the University of Huddersfield's IRR in early 2016. Before that he had been Vehicle Track Interface Engineer at RSSB (Rail Safety and Standards Board), which is one of the IRR's key partners. The article for which he and Dr Bezin shared the George Stephenson Gold Medal is in the August 2015 edition of the Journal of Rail and Rapid Transport. The lead author is Bridget Eickhoff of the RSSB and the others are Laura Mazzola, Hinnerk Stradtmann, Andreas Haigermoser, Hugues Chollet and Jérémy Landais.